Energy in Depth: Disturbing Video Shows How Out of Touch Fringe Anti-Fracking Activist Group Is With Ohioans - "A disturbing anti-fracking video from Appalachia Resist! — perhaps the most rogue fringe activists group in Ohio — was recently posted to social media in an apparent effort to save their failed campaigns. The group, which has been tied to..."
Reuters: All Drill, No Frack: U.S. Shale Leaves Thousands of Wells Unfinished - "U.S. shale producers are drilling at the highest rate in 18 months but have left a record number of wells unfinished in the largest oilfield in the country – a sign that output may not rise as swiftly as drilling activity would indicate. Rising U.S. shale output has rattled OPEC's most influential exporter Saudi Arabia and pushed oil prices to a near..."
Press release: Ascent Resources Utica Holdings, LLC Announces Offering Of $1.5 Billion Of Senior Notes - "Ascent Resources Utica Holdings, LLC ("ARUH") and ARU Finance Corporation ("Finco" and, together with ARUH, the "Issuers") announced today that they intend to offer $1.5 billion of senior unsecured notes ("Notes") in two series due in 2022 and 2025 in an unregistered offering to institutional investors. The Notes will be guaranteed by Ascent Resources – Utica, LLC ("ARU"). The net proceeds from the offering..."
WTOV: Cera Pushing New Bill that Would Assist Areas Impacted by Shale Drilling - "A new bill that would assist areas impacted by shale drilling. State Representative Jack Cera, R-Bellaire, says the oil and gas severance tax should come back to benefit the area in which it was generated, and he is working to reinvest severance tax revenue in eastern Ohio. "There’s about $54 million sitting in this fund right now. That's money that's never been expended, and my concern..."
Vorys Energy & Environmental Law Blog: Ohio Court Construes the Term “Holder” Under the 2006 DMA to Include the Heirs and Devisees of the Record Owner - "Ohio’s Seventh District Court of Appeals recently interpreted the term “holder” under the 2006 version of the Ohio Dormant Mineral Act (R.C. § 5301.56) (“2006 DMA”) and held that the term should be construed broadly to include the heirs and devisees of the record owner of the severed mineral interest that succeed to the severed mineral interest by intestacy or..."
Morningstar: Antero Gears Up for NGL Growth - "Antero Resources (AR) produces natural gas from the Marcellus Shale in West Virginia and the Utica Shale in eastern Ohio. Henry Hub prices are close to our midcycle estimate of $3 per thousand cubic feet, which is well above the company’s cost of production. Though basis differentials in..."
Forbes: State Approves Keystone XL, World Does Not End. Film at 11. - "It's been a very busy week for pipeline-related matters. On Monday, I wrote about the Dakota Access Pipeline, and the latest controversy surrounding whether the state of North Dakota will receive any help in paying the huge tab it has incurred policing and cleaning up after the protesters. On Wednesday I wrote about..."
Fuel Fix: Halliburton Adding 2,000 Jobs as Oilfield Activity Picks Up - "Halliburton on Friday said it’s adding 2,000 U.S. jobs in the first quarter and ramping up activity faster than anticipated to try to match the surging oilfield activity, especially in West Texas. In a rare operations update call, Halliburton Chairman and CEO Dave Lesar said the company is spending more money..."
EID has learned that one school in Guernsey County has seen its funding double, thanks to minerals produced from shale wells. This is a real-world example of the positive impacts discussed in EID’s recent report. Ohio communities are just now starting to get a glimpse of what’s to come as ad valorem taxes, or real estate property taxes, paid on oil and natural gas production are starting to pay dividends. As EID’s report showed, six Ohio counties have collectively received $43.7 million from this one tax alone, based on production through 2013. One of these counties was Guernsey County, which is in the oil window of Utica Shale development and was a top oil-producing county every quarter last year. As EID’s report examines, ad valorem tax revenue stays 100 percent local, supporting schools, county governments, townships, villages, mental health centers and first-responders. Through the Freedom of Information Act (FOIA) and help from the Guernsey County Auditor’s Office, EID has learned that one school in Guernsey County has seen its funding double, thanks to minerals produced from shale wells. Mineral values from the East Guernsey Local School District jurisdiction jumped more than 3,000 percent from 2012 to 2015. During the same period of time, forecasted real estate property tax payments to the school doubled from initial projections — a direct and impactful development that is entirely attributable to fracking. It’s clear that this boost was unexpected, as the school district budgeted for about $2 million (inflation adjusted) from real estate property taxes through 2017. However, the school coffers broke $4.1 million in 2015 and added an additional $150,000 to the permanent improvement fund as well. Considering there were no new levies during this timespan, it is clear that it was the oil and gas industry that gave this school a boost, rather than already over-burdened homeowners. Let’s take a look at how our recent report highlighting this important tax plays out in real life. 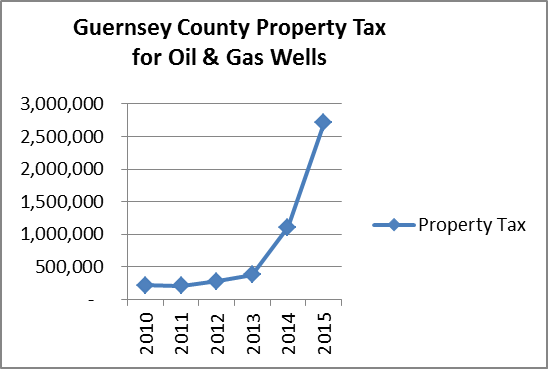 Here’s the total shale production and property tax paid on Guernsey County oil and gas wells from 2010 to 2015. As is evident by the fact that significant ad valorem taxes were collected in 2010 and 2011 despite there being no shale production in the county at that time, conventional oil and gas development has been a staple for the county for some time. But as production from shale wells started in 2012, the property tax payments received on production grew rapidly right along with it. Again, the East Guernsey Local School District was clearly not anticipating this new revenue source, as is obvious by looking at its five-year forecast below. 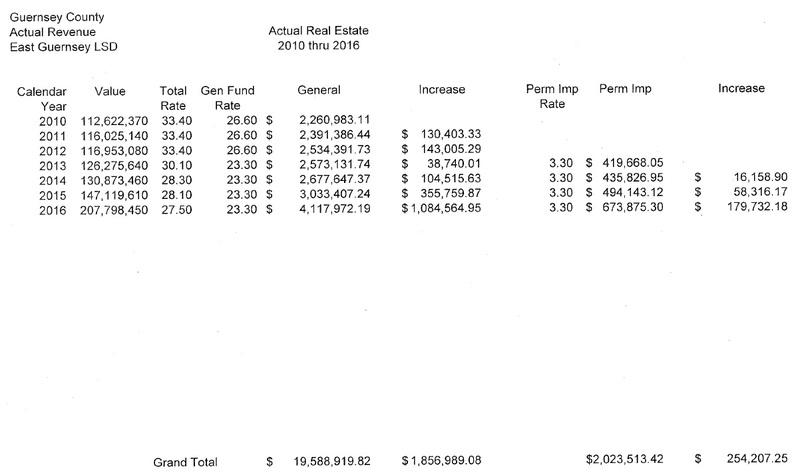 As you can clearly see, the school was expecting its inflation-adjusted revenues from real estate property taxes to stay about the same from 2010 to 2017. So just as our recent report showed, real estate property taxes paid on oil and gas production have a huge real-world impact on local communities. This has certainly been true for East Guernsey Local School District, as the forecasted $2.1 million in property tax revenue instead wound up being $4.1 million — thanks to fracking. What’s more is that this is only the beginning. As was reported this week by the Ohio Department of Natural Resources (ODRN), last year’s natural gas production surpassed 2015 production by more than 43 percent, doing so in a year in which drilling was essentially shuttered. Drilling is starting to pick up again this year, and with it, we would expect production to rise as well. That’s why we conservatively forecasted Ohio shale counties will receive $200-$250 million from ad valorem taxes from 2016-2026. As this real-world data from East Guernsey Local School District shows, these taxes are having an enormous local positive impact and providing much-needed resources to our schools, governments and social services — and doing so without raising taxes on Ohioans. The Bureau of Land Management (BLM) today conducted a competitive online auction of 1,186 acres of federal minerals in the Wayne National Forest (WNF) that brought a total of$5,196,220.07 — more than doubling what the first WNF mineral auction brought in December. The December sale of 719 acres in the WNF totaled $1.7 million, meaning the first two sales have brought in over $6.8 million. EID conservatively forecasted today’s sale of acreage from the Marietta Unit — which includes the prolific dry natural gas found in Monroe County — could yield more than $2 million. That forecast proved to be conservative, indeed! Considering up to 40,000 total acres have been approved for leasing in the Wayne and competitive online auction sales occur quarterly, this is great news for private property owners and especially the schools in Monroe County, as the federal government sends a portion of these funds back to the local communities. We are also glad to see that the Forest Service acknowledged a key issue that EID has been trumpeting with regard to the fact the Wayne National Forest is unique in that the federal government does not own the majority of the minerals in the forest. In fact, 59 percent of the mineral rights are privately owned. Up until recently, those private mineral owners were being held hostage of seeing their minerals developed. The Forest Service also acknowledges another key point that EID has consistently brought to light — that oil and gas development in the Wayne is not new. In fact, there are 1,200 active wells in the forest. Lastly, another key statement made by Mr. Scardina is the acknowledgement that oil and natural gas development can occur concurrently with multiple uses of the Wayne, whether it be fishing, hiking, hunting, or camping. This is true, because the Environment Assessment found that there would be “no significant impact” to the forest from fracking. The Ohio Department of Natural Resources has now released the production data from the Utica shale for the fourth quarter of 2016. As always, we are going to give you a look at how the numbers compare to past quarters, past years, and how they break down among the various drillers who are active in Ohio and the counties where they are drilling. We also have the top 10 oil and gas wells detailed below. While the gas production rates have been up and down since 2014, this is the first time since the Utica shale data began to be tracked that the total gas production in a quarter has declined from the quarter before. As expected, oil production saw a large decrease from 2015. The slowdown in gas production during the 4th quarter means that the total for 2016 falls a little short of eclipsing the total gas production of 2014 and 2015 combined. 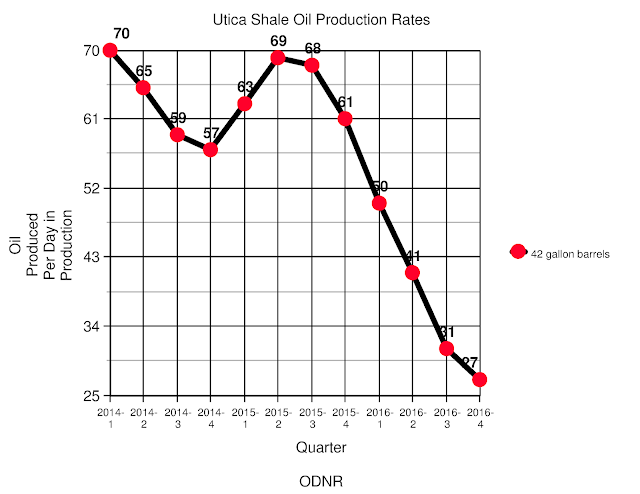 Over 47% of the total Utica shale production from the last 6 years came during 2016. Jefferson County really came onto the scene during the 4th quarter in gas production. In quarter 3 there was not one Jefferson County well in the top 10 gas producers, but in quarter 4 it was the location of the top 2 gas producing wells and 4 of the top 10. GoErie.com: Doing Business with the Cracker Plant - "A $6 billion petrochemical plant to be built near Pittsburgh over the next five years will produce more than the polyethylene building blocks for the plastics industry here and worldwide. It will also produce jobs, a new market for existing businesses, spinoff businesses and cheaper raw materials in the..."
Marcellus Drilling News: EIA Drilling Report: Gas Prod to Hit Another Record High in April - "Yesterday MDN’s favorite government agency, the U.S. Energy Information Administration (EIA), issued our favorite monthly report–the Drilling Productivity Report (DPR). The DPR is the EIA’s best guess, based on expert data crunchers, as to how much each of the U.S.’s seven major shale plays will produce for both oil and natural gas in the..."
Canton Repository: Editorial: Gas Industry Gushing Over Encouraging Signs - "In the volatile oil and gas industry, it has been a few years since the overall outlook has been encouraging. Signs lately, however, give industry followers reasons to be optimistic. Prices are trending in an upward direction, federal approval has come for several projects and the administration of President Donald Trump was barely in office when it backed two long-stalled, controversial..."
Tribune Chronicle: Meeting to Address Oil, Gas Projects - "A briefing on oil and gas exploration and related pipeline construction activities is scheduled for 6:30 p.m. Thursday at the Trumbull Career and Technical Center. The program, open to the public, will be facilitated by Dale Arnold, Ohio Farm Bureau Federation director for energy, utility and local government..."
Bloomberg: Trump Tax Cut May Save Oil Explorers $10 Billion, Boost Drilling - "The Trump administration’s plan to slash corporate tax rates could free up more than $10 billion a year for U.S. oil explorers, opening new opportunities to boost drilling at a time of uncertainty in the marketplace. Crude prices in New York have fallen 10 percent since the end of 2016 as added drilling in America’s shale fields offset..."
Bloomberg: Trump to Drop Climate Change From Environmental Reviews, Source Says - "President Donald Trump is set to sign a sweeping directive to dramatically shrink the role climate change plays in decisions across the government, ranging from appliance standards to pipeline approvals, according to a person familiar with the administration’s plan. The order, which could be signed this week, goes far beyond a targeted assault on Obama-era measures blocking..."
The Tribune: Work Begins on Burlington Area Pipeline Segment - "People in the Burlington area are seeing the first phases of construction on a new segment of a natural gas pipeline that will reach under the Ohio to Wayne County, West Virginia. Work on the BM-111 Loop..."
The Hill: Trump to Repeal Obama Fracking Rule - "The Trump administration is planning to repeal former President Barack Obama’s landmark 2015 rule setting standards for hydraulic fracturing on federal land. Justice Department lawyers revealed the decision late Wednesday in a filing with the Denver-based Court of Appeals for the Tenth Circuit, where the federal government..."
Forbes: Oil Prices Fell 12% Last Week. How Little You've Heard About It Shows How Much Has Changed - "Crude oil prices tumbled 12% to $47.72 a barrel for the week that ended March 14. While there are a lot of variables affecting oil prices, this drop didn't produce significant slides in prices of other assets, showing oil and much of the global economy appear closer to an equilibrium. "Last year oil was being viewed as..."
Oil & Gas Law Report: Ohio Supreme Court to Hear Appeal on Expansion of Implied Covenants to Encompass Deep Rights - "On March 15th, 2017, the Ohio Supreme Court accepted a discretionary appeal in Alford v. Collins-McGregor Operating Company, Washington App. No. 16CA9, 2016-Ohio-5082. The Alfordappeal arises from the Washington County Court of Appeals, Ohio’s 4th Appellate District. In Alford, the 4th District declined to expand Ohio’s implied covenant of reasonable development to encompass unexplored, deep formations..."
During the fourth quarter of 2016, Ohio’s horizontal shale wells produced 3,577,553 barrels of oil and 345,241,753 Mcf (345 billion cubic feet) of natural gas, according to the figures released today by the Ohio Department of Natural Resources (ODNR). We will post a breakdown of this data as soon as we have finished parsing through it and put together our graphs and spreadsheets, which will include comparisons to previous quarters and years and a much closer look at the top wells and most productive areas in Ohio during the 4th quarter and full year of 2016. Federal officials have issued their approvals, and construction of the 713-mile Rover Pipeline is set to begin. A group of around 250 landowners is accusing Rover Pipeline LLC of failing to consult with property owners before felling trees along the pipeline's proposed route, in violation of its FERC certificate. The landowners, represented by Goldman & Braunstein LLP, filed a motion with the Federal Energy Regulatory Commission Tuesday to enforce the Natural Gas Act (NGA) certificate the agency issued to Rover last month [CP15-93]. Specifically, the group accused Rover of violating its Agricultural Impact Mitigation Plan (AIMP) -- included in the project's final environmental impact statement -- in which the operator agreed to "consult with the landowner to determine if there are trees of commercial or other value" and to "allow the landowner the right to retain ownership of the trees with the disposition of the trees to be negotiated prior to the commencement of the land clearing."